The mystery of the ‘59 Jazzmaster tone. I still see discussions on internet forums about whether the wood in an electric guitar has any effect on its tone or if it’s all in the pickup. There are some people who insist the instrument itself makes no difference in its tone. There was a good series of articles a few years ago in the Guild of American Luthiers quarterly magazine about how just the body shape of a solid body electric guitar affects nodal patterns of vibration at different frequencies—just the shape of the body! This is the fifth article in our series about best selling Lollar pickups. 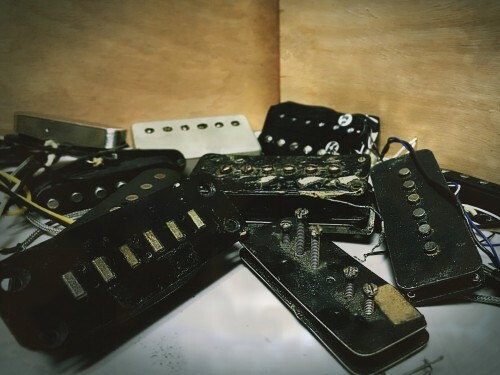 In this article we’ll talk about some of our best selling items that can’t be classified among the main categories of pickups like strat, tele, and humbucker style pickups. Lollar Jazzmaster style pickups are a consistent favorite. Overall the Lollar Jazzmaster style pickups have a nicely detailed treble and a bit more midrange and bass when compared to a strat style single coil. They also have a very responsive dynamic range. As you may already know, the size and shape of a pickup coil affect the quality of the tone it will produce. 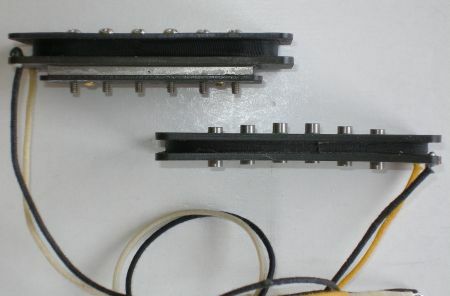 For example, the Jazzmaster coil is very short (1/8″) but very wide. This gives it more surface area and allows the pickup to sense the vibrations of a longer length of the strings. This is part of why they have their own unique tone qualities. 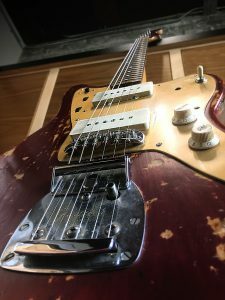 To read even more about the unique properties of our Jazzmaster pickups, follow this link to an earlier Lollar pickups blog about Jazzmaster pickups and the Jazzmaster guitar. Also worth mentioning are our “hybrid” style P-90 / Jazzmaster pickups. They are an interesting option to consider if you are looking for a little more midrange and a little fatter tone than our standard Lollar Jazzmaster. The thickness of the coil and internal construction of the bobbin is actually like a P-90. But the forbon flatwork top and bottom are sized to fit a Jazzmaster sized cover, rather than a P-90 cover. So essentially, they are a P-90 coil wound onto a Jazzmaster sized bobbin. And rather than the fixed AlNiCo pole piece rod magnets of a Jazzmaster, they have the adjustable pole pieces of a P-90. They are also made using two flat bar magnets – just like a P-90. We make the hybrid P-90 / Jazzmaster in all of the same versions that we build our standard P-90s, including an underwound neck and an overwound bridge. Compare the Lollar P-90 style Jazzmaster to the standard Lollar Jazzmaster. This photo shows a side view of the hybrid Lollar P-90 /Jazzmaster (top pickup) and the Lollar standard Jazzmaster (bottom pickup). When you look at them from this angle you can really see the differences between the two pickups. You can see the thin Jazzmaster bobbin (1/8″) and the thicker P-90 style bobbin (1/4″). You can also see the P-90 style bar magnet spanning the full distance alongside the adjustable pole piece screws of the hybrid P-90 / Jazzmaster. Compare this against the 6 individual pole piece magnets of the standard Jazzmaster. You can also see how these 6 AlNiCo pole piece magnets are set to a radius. To read more about either of these styles or to listen to sound clips, follow this link to Lollar Jazzmaster pickups. Another popular “miscellaneous” pickup is our Single Coil for Humbucker Rout. For a “non-standard” pickup, they are a popular choice. The main advantage to this pickup is that they offer a chance to install a single coil pickup into an instrument that is routed for full sized humbuckers. AND – best of all – no routing required. We like to be precise with our terminology when talking about this pickup. Customers often call and ask if we make a “P-90 for humbucker route.” We think it’s important to point out that this pickup sounds very much like a P-90, but it’s not a “true” P-90. Like we mentioned above, the size and shape of the coil affect the tone. The most popular cosmetic choice is the chrome surround with the matte black top. To learn more about this pickup please follow this link to Lollar Single Coil for Humbucker Rout pickups. We hope you have enjoyed this series of blogs on best selling Lollar pickups. Like we’ve mentioned before, there is no “wrong” answer. All of our models of pickups have their own unique advantages, and much of what’s involved in the selection process is simply a matter of personal preference. Our best advice is to know what you’d like to accomplish for the particular instrument you’re working with, and then choose the pickups that will help get you there. Contact us if we can help point you in the right direction. One of the significant differences between Jazzmasters and other Fenders is that the main tone and volume controls use 1 Meg ohm pots. When set on 10, these pots do not roll off much signal. The result is more high end and presence than you are use to hearing on an electric guitar. The extra treble can be annoying if you use an amp that can reproduce high end treble (like a blackface Fender amp). On Fender tweed amps that extra treble is nowhere near as noticeable. So the trick to getting a good tone with the Lollar Jazzmaster pickup is to roll either the tone or volume down a click or two. This will roll off the extreme high end. (I prefer using the volume) The idea is to roll it a minimal amount—far enough to affect the tone level, but not too far to actually start hearing a volume drop. If done in this way, the tone will change long before the volume is affected. Using the volume control this way will leave treble in reserve if you need it occasionally to cut through a mix. On tweed amps if you are pushing them pretty hard you can leave the volume on 10. Another option is to replace the volume and tone pots with a lower value pot. The 500K would probably have about the same tone as a one Meg pot on 8. I personally like the one Meg pots, so I have never tried other values to determine what works. Everyone wants to know what the black switches on the upper bout do. There is one slider switch and two rollers. The slider switch defeats every pickup selection except the neck pickup alone. Once the slider switch is activated only the neck pickup functions, and the main 3-way switch for the pickups will no longer work. When the guitar is in the neck-only mode, the two rollers act as an additional volume and tone for the neck pickup. These allow you to preset a volume and tone level different than your main volume and tone controls. You can play normally with the main controls working… put it in the bridge pickup position with full volume for a solo then hit the slider switch and it drops you into the neck pickup with whatever volume and tone you have preset with the rollers. It’s an interesting idea but I have never found much use for it. Thanks very much for reading our three part series on Jazzmaster style pickups and the Fender Jazzmaster guitar. We hope it has been informative. Follow this link to see more details on our Lollar Jazzmaster pickups. People often comment about the overall brightness of Jazzmasters. The treble quality can have an aggressive, biting tone, but it’s due to the idiosyncrasies of the guitar design… not just the pickups. Some of the brightness is due to loss of the “body” of the tone (and sustain) because of the bridge design. Possibly part of the delegation of the Jazzmaster to surf music is its lack of sustain compared to a Strat or Tele. Tonal “body” and sustain are directly related to the bridge having a low angle of string break which robs sustain and fullness of tone. You either have to run very heavy string gauges, or change the geometry of the bridge and neck angle by shimming more angle into the neck and raising the bridge up to increase the angle of the string over the bridge to the tailpiece. The extra break angle exerts more downward force onto the bridge and helps maintain a solid connection between the strings and the bridge saddles. You can also use a lighter gauge string if you increase the downward force… otherwise a low angle of string break would cause the strings to pop out of the saddles if you get aggressive with the pick. Another mod you can do (that is completely reversible) is to add a part called a buzz stop. This is a roller you attach between the bridge and the tailpiece that further increases the string break angle. I use one and highly recommend it if you play hard and use strings lighter than .012, or bend strings quite often. One more idiosyncrasy with the Jazzmaster… the string ground on the early Jazzmasters and possibly others is poorly executed. The bridge fits loosely into a couple of ferrules which the ground wire is attached to. This is the same case in the telecaster model that came with the factory installed Bigsby. When the whammy is used, contact with the ground wire can be broken and the guitar can become noisy. A fix for this problem is to move the ground wire to the whammy bar / tailpiece combination. Noise levels on a Jazzmaster are higher than on a Strat pickup due to its larger surface area. You can expect more 60 cycle hum than a typical Fender (more of a P90 level hum), but Jazzmasters were always RWRP sets, which reduced the hum when the pickups were used together. Next week’s blog will discuss Jazzmaster switching, and getting optimal tone. In the meantime, learn more about Lollar Jazzmaster Pickups on our web site.